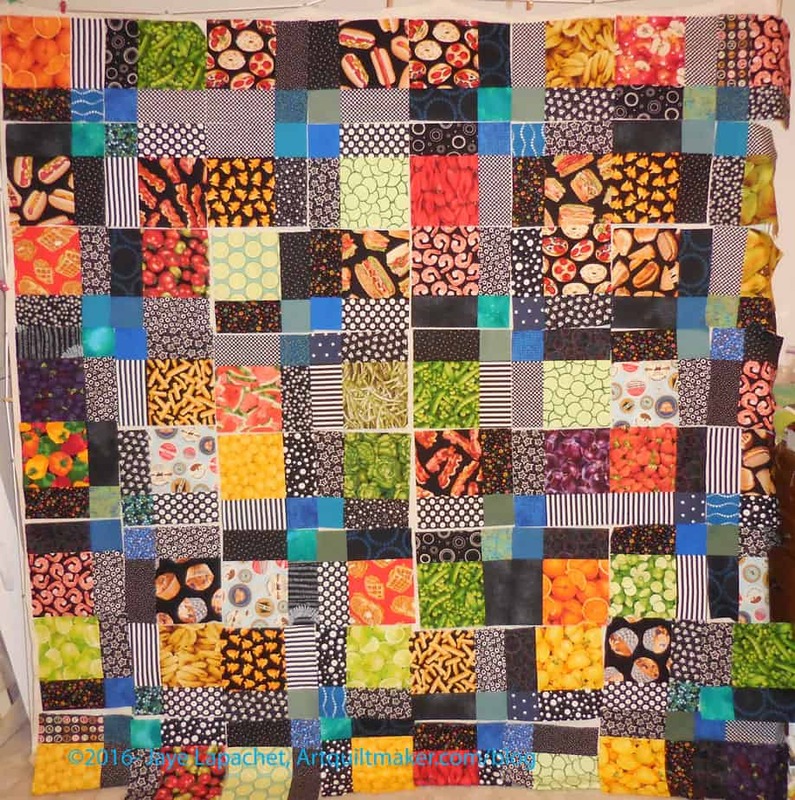 Last Monday was the day to start the latest Food Quilt. The YM wasn’t home and DH was doing his NSGW stuff, so I was pretty much left to entertain myself. 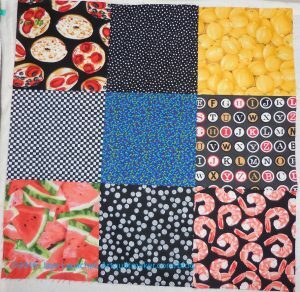 😉 It might be the last Food Quilt, but we will see. After making the binding for FOTY 2015, I started sewing the 9 patches I needed to get this quilt started. I made really good progress. The first one was quickly followed by 6 of them. I was shocked to get all of them done in one day. I had some leftover parts. Poor counting. 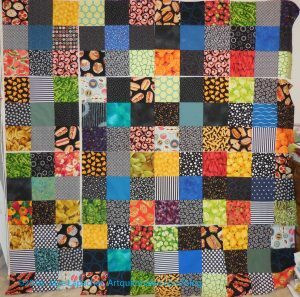 I thought I would use them for the back or for another quilt. Then SIL came over to talk about sewing and we discussed the size. 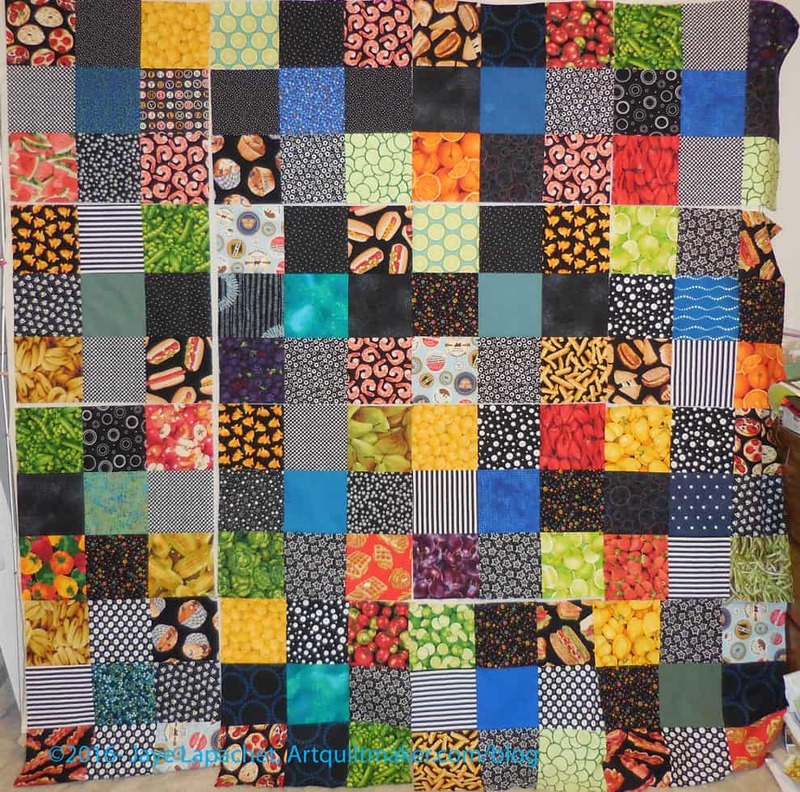 The giftee for this quilt is very tall and would not cover him, so eventually, after discussing rearranging the blocks, I decided to make 4 more blocks. I will use the extra parts as a starting point. After making all the 9 patches, I decided I would see what cutting the blocks up looked like. That is always a fun exercise. I thought I would do one. In a short amount of time, I did them all. I’d like to do a different layout than the other two. 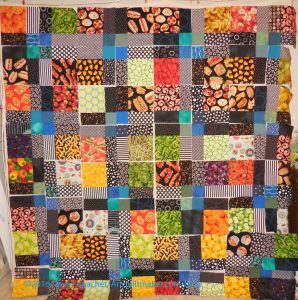 Food Quilt #2 has a kind of zigzaggy look and Food Quilt #1 has a more traditional one block surrounded by sashing and cornerstones look. I am toying with putting the blues together in the middle. I think it looks good. 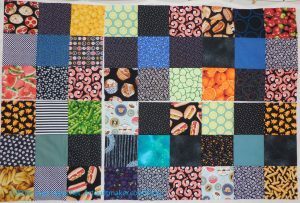 If I do that layout, I’ll have to repress some of the seams. 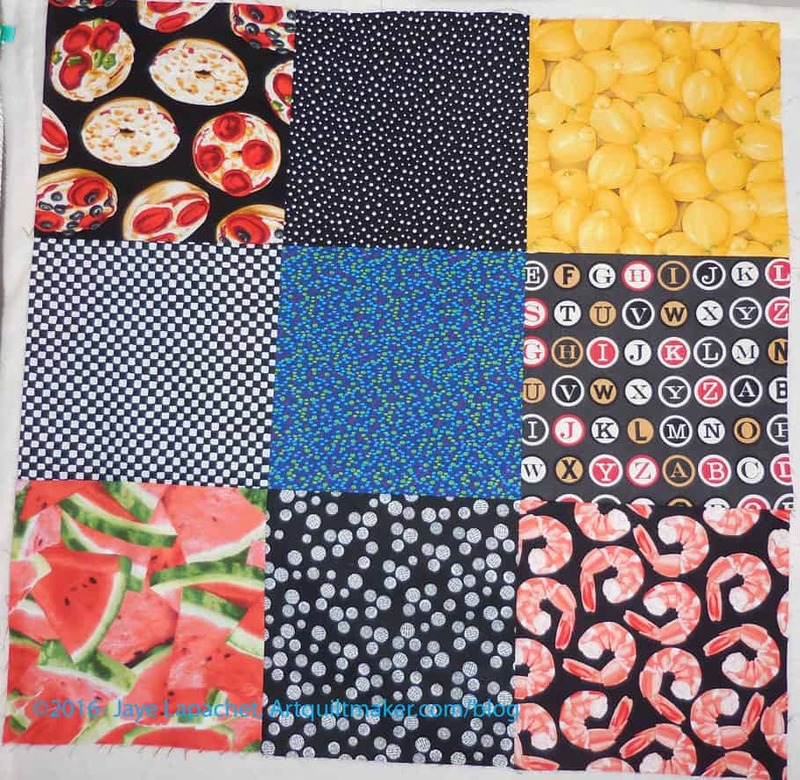 The one thing I am contemplating is whether I want the food fabrics touching. I plan to look online at some layouts for the Disappearing 9 Patch. I think I will be able to get this done relatively quickly. After I make the extra blocks, the holdup will be the applique’ on the back and I have a good process in my head for making the templates, so it is a matter of sitting down to do it.